1. Pokwang's funny here, as she always professionally is. Her all-out almost always screaming tone though when she does jokes can be painful to watch. It almost feels like it'll be no time before her voice gets turned into Gollum's. Also, her klajsdgchukar rua language is a perfect signal Pinoy language's about to be universal. Mylene Dizon's "That woman is in my pool" (still makes me laugh as of this writing) deserves a place in classic Filipino lines. Along with "Bababa ba?" and "Mommy, yung sharpener ko hindi na sharp." 2. 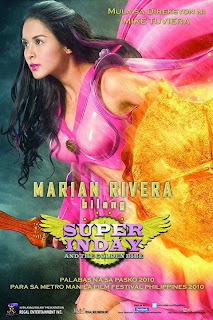 Holy creep there's an actual duck under Marian Rivera's Skirt. Duck. Under. Marian Rivera's Skirt. Sounds like they're one letter away to get rated R.